Falls involving senior citizens are all too common and may have dire consequences. Taking preventative measures is important, such as examining the home for fall risks like throw rugs and various tripping hazards, inadequate lighting, and a lack of appropriate grab bars and railings. But there’s another tactic being suggested now: developing a fall plan of care, which, when executed accurately, has been shown to decrease fall-related emergency room visits by up to 40%. Remain aware – Avoid letting your mind wander and instead maintain your full focus on your surroundings. Check eyesight – Frequent eye exams and constantly wearing eyeglasses if required can ensure tripping hazards are noticed and avoided. Prevent head injuries by intentionally turning your face away from the fall, or tucking your chin to your chest if falling back. Bend the knees and elbows to stop the stiffness that may trigger a break to your elbow or wrist when trying to catch your fall. Roll through the fall, which distributes the impact of the fall over a greater percentage of the body rather than concentrating it on a single area. Attempt to fall on fatty tissue, such as on the thighs or bottom, rather than on more bony areas like hips, knees, and elbows. Make certain that all walking areas both in and out of the house are free from clutter and any potential tripping risks, such as electrical cords. Keep floors, particularly in the bathroom and kitchen, clean and dry. Make sure handrails are in place and secure alongside all stairways. Remove and replace any tattered carpets and remove all loose rugs. 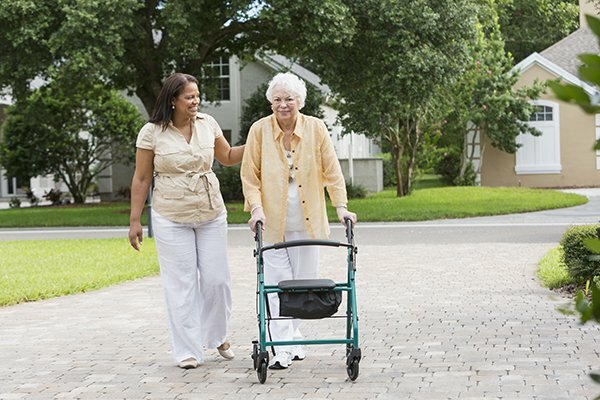 At Heaven at Home Senior Care, our Denton home care team is experienced in making your home environment as safe and secure from falls as it can be, and we are knowledgeable in providing ambulation help and oversight when needed to help make sure fall risk is minimal. We’re also on hand to take part in physician-approved fitness programs to increase balance and flexibility, resulting in improved overall health. Contact us online or call 866-381-0500 for a free in-home assessment to find out additional ways we are able to help!